We have roots that go back over 80 years in the construction industry. And over those eight decades, we’ve worked with everybody from owners and developers to subcontractors. Whether we’re on the other end of the phone, unloading the delivery truck, in the plant, or with both hands on the shovel, we know how important safety is during every step of the project. All projects and positions come with challenges and risks. The only way to avoid costly mistakes and keep you and your crew safe is to be prepared. Start here to learn about job site safety. According to Webster's Dictionary, safety is a noun meaning “the state of being safe; freedom from the occurrence or risk of injury, danger, or loss.” Considering the nature of the construction industry and the environments we work in, is the “freedom from the occurrence or risk of injury…” even possible? No. Risk exists everywhere and at all times to varying degrees. Everyone has a target level of risk they feel comfortable operating under. In fact, one could say that what actually defines a safety risk is rather subjective; it's dependent on a person's position, age, environment, experience, risk tolerability, and more. In almost any activity — unbeknownst to themselves — people evaluate the risk they feel and compare it against the amount they are willing to accept. The action of weighing the risk is subjective and is often based on confidence and comfort. Personalities and psychology also play a large role. We create the future of cities, communities, and families. But we can't realize these visions if we don't keep our own well-being and future in mind. Errors occur in every industry. But, on jobs large and small, our mistakes can be costly. The consequences of an accident during construction can turn into more than just a lost customer, a delayed opening, or a fine. It can mean that you won’t go home to your family. Whether you're complying with federal safety regulations or making sure your employer has the correct processes in place, safety has to be a priority. More efficient workers, fewer errors on the job, and an overall better workplace culture are the results of a safety-conscious job site. Alternatively, an unsafe work environment can lead your team to think that you don’t value their health and well-being, which reduces trust. They’ll work slower and less efficiently. According to estimates from the U.S. Department of Labor, having “a good safety and health program can save $4 to $6 for every $1 invested.” Of course, saving lives because procedures, regulations, and codes are followed is even more important. 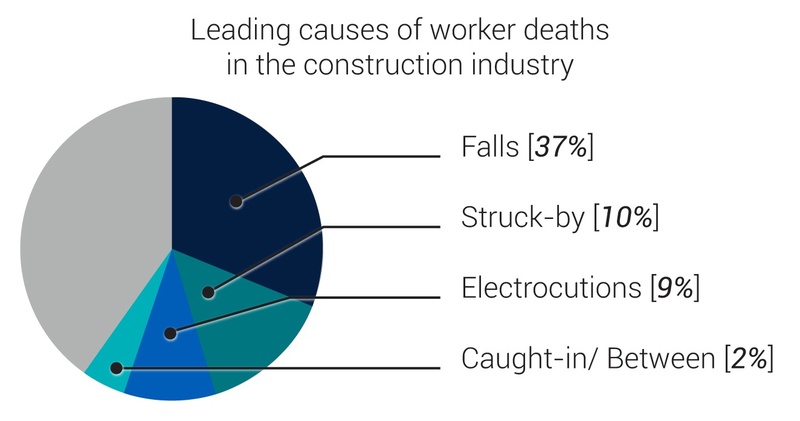 According to OSHA, there are four types of incidents that together added up to more than half of all construction worker deaths in 2015. All of these hazards can be found on common job sites, and they can be avoided if you learn how to recognize and prevent them. And, if it’s something that you or others might come across (or perhaps you already have), reporting the hazard is key. Anytime you work at a height of four feet or more, you could be at risk of injury by falling after losing your balance or not having the proper bodily support. If using a ladder, make sure you're following ladder safety protocols by ensuring three points of contact. For other scenarios when you need a fall arrest system, use the correct personal protective equipment (PPE), which consists of a body harness, an anchorage point, and a connector such as a lanyard, deceleration device, lifeline, or a suitable combination of these. Flying, falling, and sliding objects can strike and injure a worker. Wearing a hard hat can provide some protection, but more specific tips include not working below elevated objects and properly securing objects on higher levels. You can also make sure toe boards are erected, and screens, guardrail systems, or canopy structures are in place. Always check equipment labels and certifications to avoid being exposed to a lethal amount of electrical energy. Failing to follow OSHA procedures for lockout tag out can easily lead to serious injury or fatality. Additionally, you should always know the exact location of both underground and overhead utilities. Being trapped or buried in unprotected trenches is a nightmare that, unfortunately, occurs too often. You should never work in an unprotected trench that is 5-feet deep or more, and you should make sure the sloping is at the correct angle. Trench boxes don't prevent cave-ins, but they will protect you if one were to happen. Other types of caught-in/between incidents involve being pinned between moving materials and working with unguarded moving parts. To avoid these types of accidents, never remove a safety guard or place yourself between moving materials. Additionally, you should never wear jewelry and should avoid wearing loose clothing. 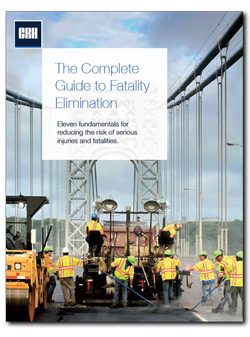 Learn the 11 fundamentals for reducing the risk of serious injuries and fatalities on the job site. Whether it’s coming close to falling from an edge or being in too much of a rush to properly protect the area, many workers don’t report near misses. There are several reasons including embarrassment, not having a system available to report, the pressure to keep quiet, and more. More than 4,500 workers are killed on the job every year according to OSHA. And, approximately three million are injured, despite the fact that there are laws requiring employers to provide safe and healthful workplaces for their workers. Whatever the reason that is holding you or your team back from fully following safety requirements — it’s time to rethink it. Safety needs to be a priority on every job site. Changing a company’s culture can be a long, slow process. Construction safety needs to be woven into all activities, every day, and for everyone. Below are some tips that can help you get the momentum you need to shift your company’s culture and make safety the number one priority. Risk tolerance refers to a person’s capacity to accept a certain amount of risk. Workers should be aware of how they can get hurt, and they need to comprehend the extent of a job's risks. There are numerous factors that influence how tolerant and aware one can be of risks in certain situations, and it’s important to communicate these with employees (and review them ourselves) in order to truly understand the hazard and the potential outcomes. One example is when a younger worker overestimates his or her physical capabilities. In another scenario, an older worker familiar with construction site processes overestimates his or her experience. Both situations can lead to increased risk tolerance. If you do the job like it's the first time you've done the job, every time, you can have a much safer workplace. Frick and Frack make entertaining safety videos. Don't miss out on their antics training. Consider a training program. Visit the OSHA website for educational materials covering a variety of topics about worker safety and occupational hazards. Run a bonus or awards program to incentivize employees reporting infractions or potential accidents and to congratulate them on reaching a particular number of days without accidents. Consider apprenticing a new employee with a veteran who is highly conscious of safety practices instead of dated safety videos, because learning by doing leads to much higher knowledge retention rates. We can’t just expect people to make safety a priority if the foreman, safety director, or principal doesn’t follow best practices. One of the best ways to encourage a safety culture is to lead by example and encourage proper use of PPE. However, just showing up on the site with the correct PPE on won’t cut it. You need to be the enforcer of policies. Doing so will ensure your company provides a safer work environment, higher worker morale, and less downtime from accidents. If you don’t change your culture, ignoring safety could be catastrophic for your business. Per OSHA, lost productivity from workplace injuries and illnesses in the U.S. costs companies $60 billion each year. With more than 14 people every day who don't make it home from workplaces across the United States, it's important you know how to prevent accidents on the job site. All employees must take responsibility for their own safety while encouraging companies do their part to prevent serious injuries and deaths as well. One of the simplest ways to avoid accidents is to know how to recognize and identify hazards. There are simple steps that can help you recognize possible incidents and what you can do to prevent them. Below are just a select few. Before each shift, assess the work site to ensure that surfaces have the structural strength and integrity necessary to support the workers. Wear hard hats and the correct PPE – a non-negotiable step. Make sure employees know best practices for isolating operating machinery, working with lifting operations, and working around utility lines. Doing a thorough risk assessment and thinking about the severity of risk prior to starting a new task, or a job you’ve done hundreds of times before, can keep you safe and eliminate fatalities on the job site. Frequency: How often are you exposed to a hazard while doing a task? Likelihood: What is the probability that an incident will happen while doing a task? Severity: How serious might the injury be if an accident did occur? From the CEO and top managers down to the men and women on the job site, there are basic fundamentals that can be encouraged and practiced, ensuring the risk of fatalities is eliminated. Employees should feel empowered to take responsibility for their own safety, and companies should do everything in their power to prevent serious injuries and deaths. Errors occur in every workplace.